F2 - Ah Hoy, Me Hearties!!! Another exciting week for F2. First, the PDSA with the lovely Kaya and then Pirate Day! On Monday, Kaya was absolutely fantastic in F2. We learnt so much about how to keep pets happy and then we were given the chance to talk about our pets. We love talking about our own pets. After the talk, we played games which helped us remember what pets need. On Pirate Day, we all came dressed as pirates. 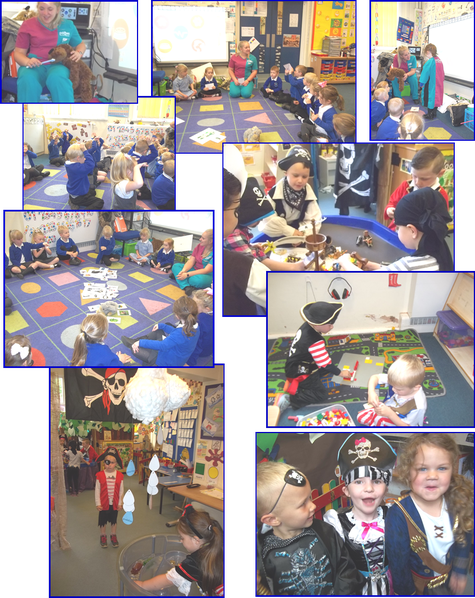 We had lots of exciting pirate activities to do in class! We made treasure maps and then took them out into the big playground; we went on a treasure hunt and we had a pirate colouring competition and we worked together as a class to write some very exciting pirate stories. We love to use our imagination in our play and learning. At lunch time we even discovered some real treasure in the bottom of our drinking cup!